* Our Activity Table (which people often call our Mini-Train Table) has all the same great features as our standard Train Table, just smaller for more flexbility and convenience. 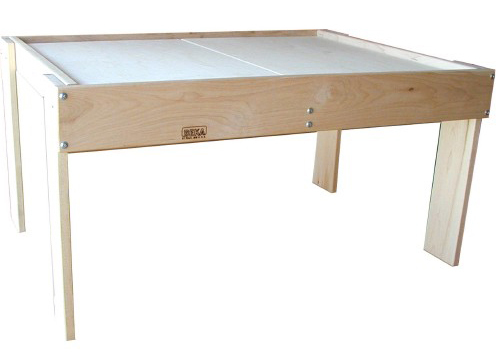 * This solid Hard Maple Activity Table has dimensions of 35" x 25-1/2" x 20-1/4" and comes with a two piece Baltic Birch top to encourage open ended play... no graphics that tell a child what to imagine. * The recessed top keeps small toys and game parts on the table... and off the floo. 35" x 25.5" x 20.25"